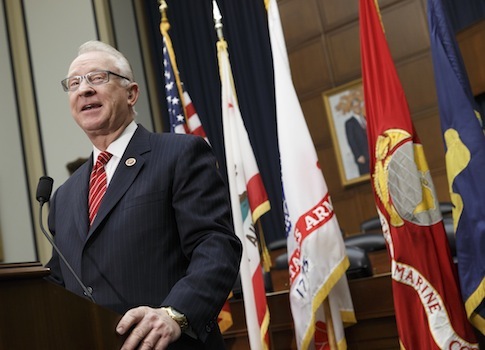 Rep. Howard P. "Buck" McKeon (R., Calif.) drew praise from colleagues on both sides of the aisle for his staunch support of the troops and national defense when announced his retirement last week. The former businessman and mayor, who returned to college at age 47 to earn his bachelor’s degree alongside his daughter, has spent the last two decades devoting his work to the nation’s military. Last year, McKeon launched the first ever "Reagan National Defense Forum," a one-day conference bringing together the nation’s top military leaders and experts to address the future and current state of national defense. Defense Secretary Chuck Hagel, Joint Chiefs of Staff Chairman Gen. Martin Dempsey, and former defense secretaries and former CIA directors Robert M. Gates and Leon Panetta each agreed to attend after receiving personal invitations from McKeon. The conference, held at the Ronald Reagan Presidential Library in Simi Valley, Calif., received high praise from former first lady Nancy Reagan. "My husband worked every day of our eight years in Washington, D.C. to ensure that our country was peacefully protected and that our military was the finest in the world," she said. "He would be so pleased to know that his ‘Peace Through Strength’ policies are being discussed again at the Reagan Library with a focus on today’s new technology and tomorrow’s needs." The biggest event of its kind will become an annual tradition at the Reagan Library, continuing to focus on what it takes to keep America safe. McKeon has been a stalwart opponent of slashing the DOD budget, opposing the automatic sequester cuts at every turn. Ever since Congress failed to reach an agreement on deficit reduction that resulted in nearly $1 trillion in cuts to defense, McKeon has fought to undo damage that will lead to a "hollow force." McKeon offered Congress a "shot at statesmanship" by replacing the cuts with a reduction in the size of the federal workforce. He also proposed to reverse the sequester in the Syria resolution last fall. 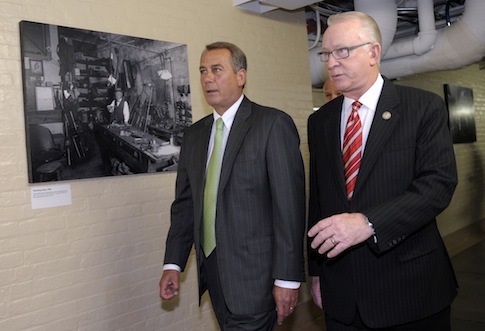 McKeon worked behind the scenes with House Budget Committee Chairman Paul Ryan (R., Wisc.) last month to achieve $31.5 billion in "near-term" relief for the defense budget. Still not satisfied, McKeon vowed to continue to push back against the sequester until the Pentagon’s budget is restored. As Chairman of the Armed Services Committee McKeon has ensured that annual defense bills have been finished on time, every year, despite debt ceiling fights, a government shutdown, and intense partisanship. Since taking the helm in 2011, McKeon has successfully secured passage for three defense authorization bills with a fourth on the way. 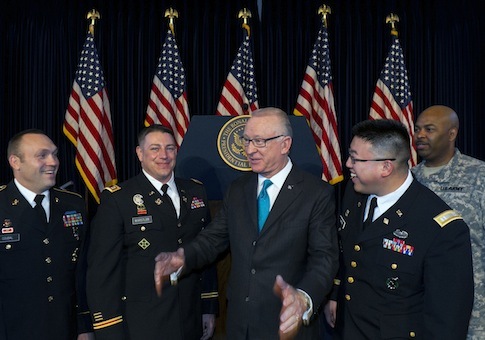 When the latest National Defense Authorization Act (NDAA) passed the House last month, McKeon said the bill "continues our effort to rebuild a military that has been tested by a decade at war." While giving men and women in uniform necessary resources, the FY 2014 NDAA also cuts wasteful bureaucracy within the DOD, prohibits U.S. funding to allow Chinese missile defense systems to be integrated with U.S. or NATO systems, and authorizes air and missile defense with Gulf Cooperation Council (GCC) countries to combat Iran. McKeon has also adamantly worked to prevent terrorist detainees imprisoned at Guantanamo Bay (GTMO) from being tried in American courts, and exposed the reality that many of the suspects housed there are too dangerous to release. McKeon launched investigations into every detainee released to see if they made it back to the battlefield. His committee’s report in 2012 found that at least 27 percent of detainees released from GTMO are reengaging in terrorist activities. McKeon led the effort last June to block President Barack Obama from transferring terror suspects to America. 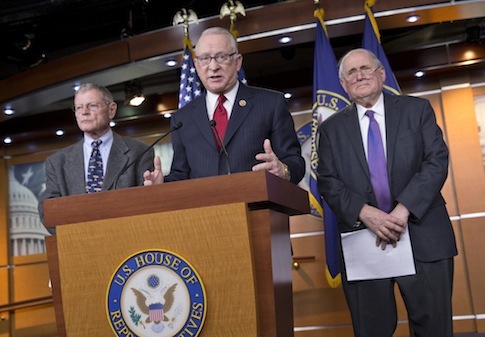 The 2014 NDAA continues to ban terrorist suspects from being brought to the United States. 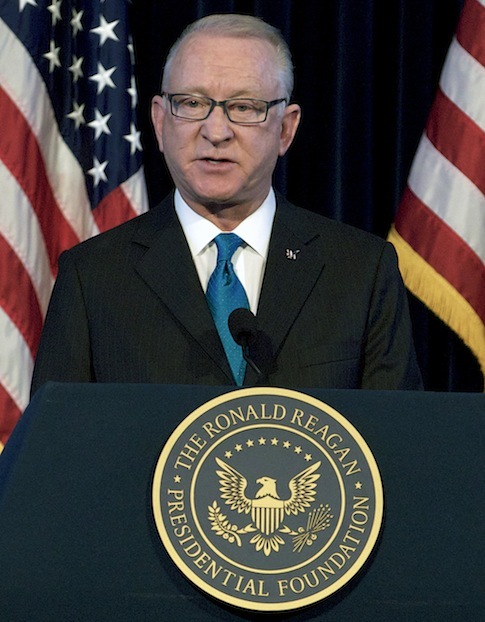 McKeon has long been a proponent of President Reagan’s mantra, "Peace through strength," urging his fellow Republicans to continue to advance the philosophy that a stronger America is the surest way to maintain stability in a dangerous world. This entry was posted in National Security and tagged Buck McKeon, Defense, Federal Budget, Government Spending, Leon Panetta, Military, Robert Gates. Bookmark the permalink.